No, we have not been on some extended vacation. Just busy, hectic lives. Thanks to some faithful chicks, we got back in the saddle and had a cookin night. We did not have a theme for the evening so we had a good variety of dishes. Let's get right to it. This is Lisa and Katie. They were inspired to bring some Mexican to our cookin night. 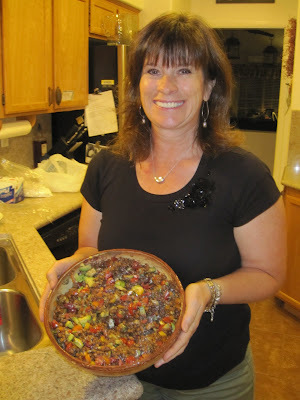 Lisa brought a really good salsa type recipe. And Katie stole my heart with some fresh guacamole. I don't have recipes for them yet. This beautiful lady is Michelle, Bev's daughter. She is one of my dearest friends. She takes after her mom in the amazing-ness department. She made a delicious soup. 1. Saute the onion in the butter until it is glassy, about 3 minutes. 2. Add the minced zucchini pieces and sauté until they begin to soften. 3. Stir in the chicken broth, corn & jalapeno’s and black pepper. 4. Bring the soup to a gentle boil, reduce the heat and cook until the corn and zucchini are soft but not mushy. 6. Add the sour cream and Parmesan cheese. 7. Optionally garnish the soup with parsley. The one pictured is a Christmas tree made from cream cheese. Take a brick of cream cheese and cut it on the diagonal. Place it on the serving plate with both the wide ends together and the skinny ones at the top, making the tree. Smooth the top together so you don't see the seam. Cut a star from a green bell pepper and add a tree "stump" of 4 or 5 pretzel sticks. Over the top is some raspberry jalapeno jam. Garish with some chopped cilantro. Serve with your favorite crackers. Blend all ing. together and chill. serve with sliced apples, bananas, or cookies such as vanilla wafers. 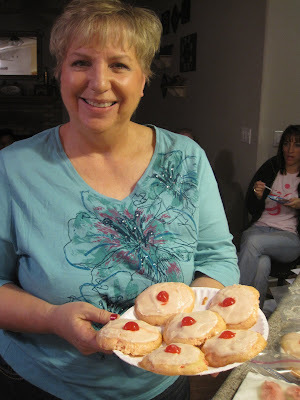 This is Mary...we can always count on her to bring us something new and exciting. She did not disappoint this time. As you layer each fruit into a bowl, squeeze lime juice on to the fruit and coat. With each layer of fruit, sprinkle a light layer each of feta cheese, cilantro leaves, and cayenne pepper or smoked paprika. This is Susie. She is our party girl. Always sharing something good to take to a party. She shared two really good dip recipes. Put into a bowl and mix together. Put cream cheese in a microwaveable bowl. Pour the chili over the cream cheese. Heat in the microwave for about 4-5 minutes. This is my dear friend Vicki. 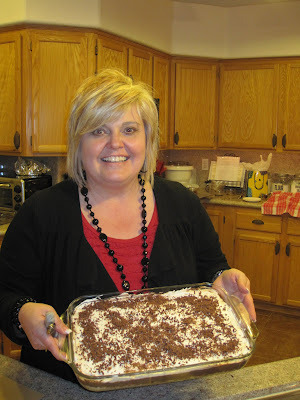 Lets just say we could all learn a few things about cookin from this lady. 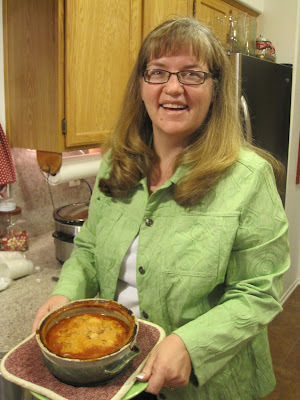 She is so smart about recipes and ideas for meals. I love her to pieces. She also brought a dip recipe. Well, some of us could have just taken a spoon ( a very large spoon) and ate it like that. Mix above ingredients together until well mixed. Then add the milk and the Coolwhip and mix until blended. Refrigerate. Connie, one of our true chicks, refused to have her photo taken. She has to be the most photogenic person there. I will get her next time. 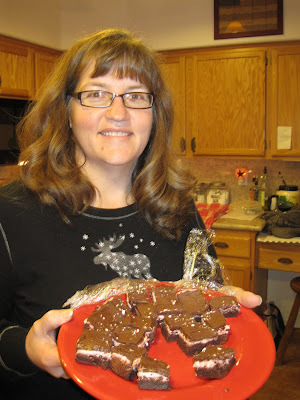 She shared a really good recipe for cheesecake bars. What a slacker I have been. 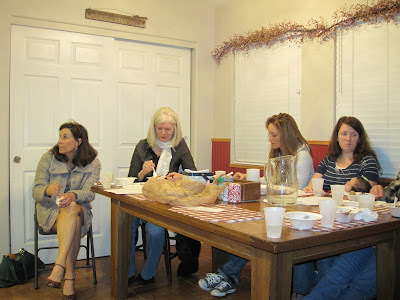 We had a chicks gathering back in November and here it is the beginning of January. What's the hurry? Right? Well, since it is almost time to meet again, I thought I better post SOMETHING from our last gathering. Our theme was seeing RED. Bring your recipes that appeared red, had a red ingredient or just tasted good...we don't really care. Now let's see if I can remember what we had. Thank goodness I took pictures. 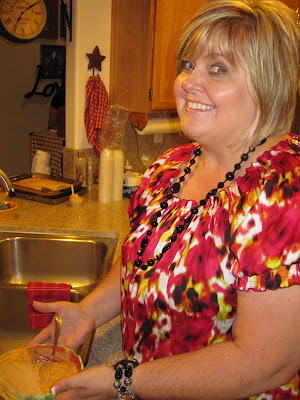 Crush or chop raw cranberries in blender or food processor. Add granulated sugar to cranberries and refrigerate overnight. Whip cream until stiff add powdered sugar to it while whipping. Add nuts, marshmallows, and pineapple and stir all together. Mix diced tomeatos (juice & all), galiic, olive oil, lime juice and 3/4 c parm cheese, basil and salt and pepper to taste. Allow to stand several hours to marinade. Slice bread at an angle and brush one side with melted butter, broil on each side to brown. Spoon mixture onto bread, and top with remaining cheese. Broil until cheese has melted. Best when served immediately. 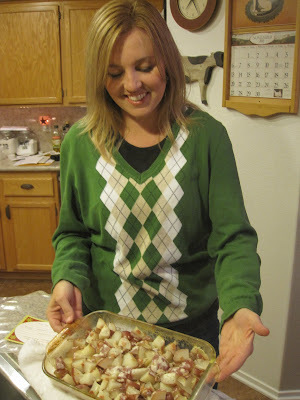 Mix with your red potatoes and pour into a greased 9X13 dish. Bake at 350 for 40 min. Mix together crushed cookies and cream cheese. Roll into small 1 inch balls. Put on parchment paper or wax paper. Melt 1 bag of melting chocolate. 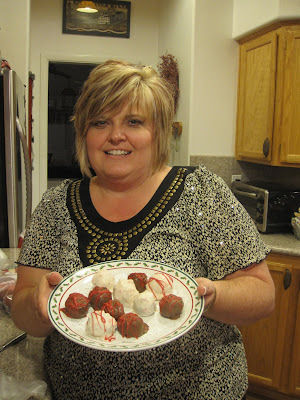 Dip balls into the chocolate. Set back on paper to harden. Makes about 24-30. **To make them festive, add crushed candy canes to teh melted white chocolate before dipping. **You can add cuts, sprinkles, extra crushed oreo's , etc to the chocolate before dipping or roll the balls in it after dipping. Preheat oven to 350 degrees Fahrenheit, spray two 9-in round cake pans with fat-free zero-calorie cooking spray, and line the bottoms with parchment paper. 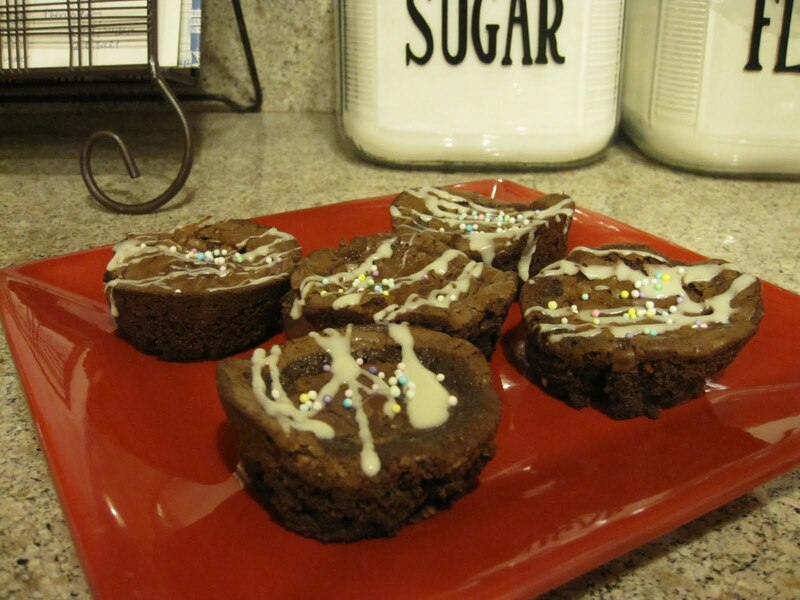 In medium bowl, combine flour, baking powder, salt, and cocoa powder. 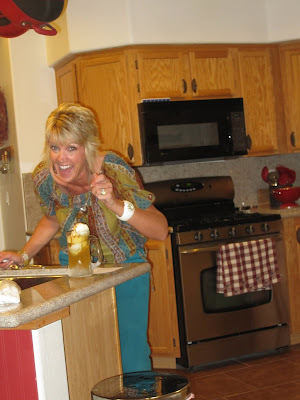 Separately, in large bowl or electric mixer, beat together sugar, applesauce, and oil. Add egg, egg whites, and vanilla one at a time, beating well after adding each one. In a small bowl combine fat-free buttermilk and food coloring. Add half the flour mixture to egg mixture, stirring well, then add buttermilk mixture, stir, and finally the rest of the flour mixture, mixing until well combined. Combine baking soda and vinegar in small bowl or measuring cup, allow to fizz, then fold into batter. Immediately divide evenly between cake pans and smooth the tops, then bake 25-30 minutes or until a skewer or toothpick inserted into the center of the cake comes out clean. Cool 10 minutes in pans, then turn out onto wire rack and allow to cool completely. Wrap layers separately in plastic wrap and freeze at least 60 minutes before icing with low-fat cream-cheese frosting, below. 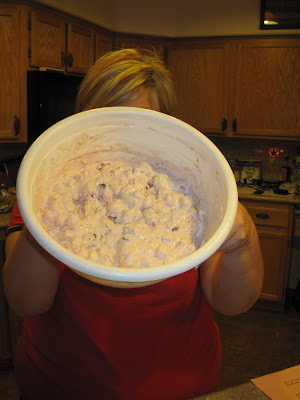 Drain/press any excess liquid from cottage cheese. Place yogurt and cottage cheese together in food processor and process until smooth. Cube cream cheese and add to processor, processing again until smooth. Add sugar in three parts, processing to mix between additions. Cover and refrigerate until hardened enough to spread. 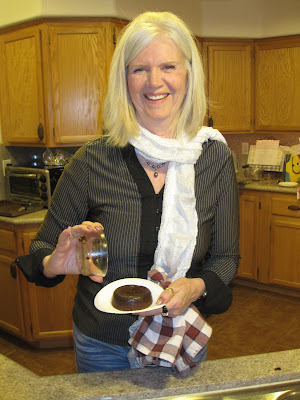 Once cake has hardened in the freezer and frosting is spreadable, cut each 9-inch round in half horizontally to create four layers (or, if you prefer a smaller icing-to-cake ratio, leave as is). Place the first on your serving platter, then spread with frosting. Repeat with next three layers, then frost the sides of the cake. Garnish with grated coconut if desired, and return to refrigerator to let frosting set. Peel eggplant and lightly brush with olive oil. Lightly saute until tender. (May also cook on grill, turning halfway through cooking time, until tender.) May season very lightly with little salt and pepper or little italian seasoning. When eggplant is done, place 1 cup marinara sauce in bottom 9 x 11 glass baking dish. Cover with one layer of sliced eggplant. Then cover with marinara sauce. Then lightly sprinkle with parmesan cheese. Repeat with another layer of eggplant and sauce until dish is full. Top with parmesan cheese. Bake at 350 for about 45 minutes or until dish is bubbling all the way through. We had some delicious fall recipes shared at our last "CHICKS" gathering. It is funny how the change of seasons brings out a craving for certain foods. The ladies did not disappoint. The food was amazing as usual. 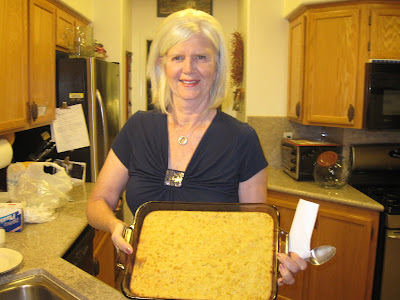 Both Vicki (above) and Connie (below), shared a corn recipe. They were both so delicious and different. In a 3-qt. slow cooker, combine all ingredients. Cover and cook on low for 4 hours or until heated through and cheese is melted. Stir well before serving. Yield: 6 servings. OVEN directions: place in a lightly greased baking dish and cook at 350 for about 45 minutes or until bubbly and hot all the way through. 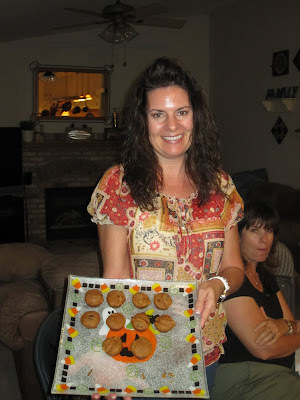 Jamie shared a pumpkin cookie recipe. Soak wheat berries overnight in water. Next day, boil in water with salt. Water should cover the berries with 1/2 inch of water on top. Bring to a boil and reduce heat, simmer covered about 45 min, or until tender. Drain and cool. Add: cherry tomatoes, red, yellow, orange peppers, red onion, avocados, fresh basil, chopped. Refrigerate for 2 hours. Add more salt, vinegar and oil if needed to make it moist. Pour apple cider and ginger ale into a frosted mug. Add ice cream. Sprinkle with cinnamon and nutmeg. Drizzle with warm caramel sauce. Serve immediately. 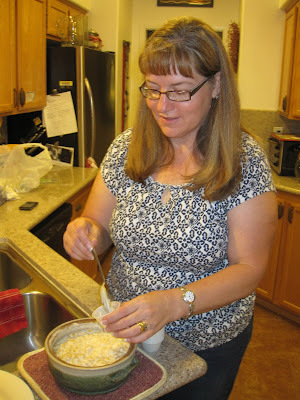 Suzi made a warm queso dip. That is good any time of the year in my book. I don't have the recipe for the cookies or the queso....sorry. Over the summer I pretty much make myself disappear form this place. Some of our die hard chicks pressed on and had a "meeting". 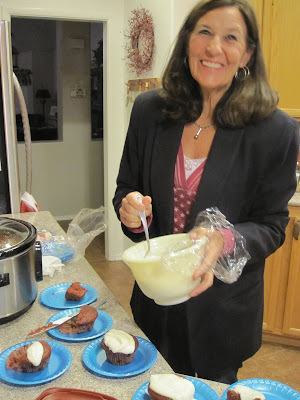 They emailed me some of the recipes and pictures from that night. Looks like some good food and fun. Pour into pie shell. Freeze or refrigerate. I have made this using different kinds of yogurt and jello. My favorites are peach, lime, and raspberry. I have added fresh and frozen peaches and frozen raspberries or strawberries. Drain the juice from the pineapple and add all together. Put in freezer for 5 hours or overnight. 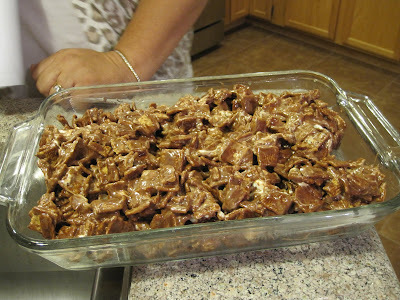 Form into ball and roll in crushed pecans. Preheat oven to 225. Beat egg whites, salt, cream of tartar and vanilla until soft peaks form. Gradually beat in sugar and continue beating until meringue is stiff and glossy. 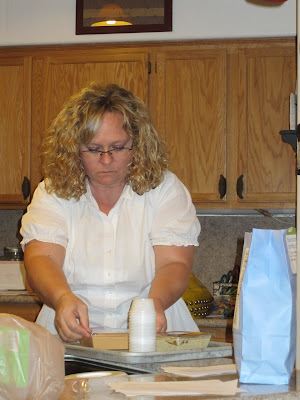 Line baking sheets with parchment paper. Trace three, eight inch circles on paper. With a rubber spatula, spread meringue evenly and equally over top of the circles. Bake approximately 2 hours or until meringue becomes bisque colored. NOTE: The low temperature will prevent them from browning too quickly. Then turn off oven, open door and let meringues ‘rest’ in oven another 15 minutes. Remove from oven and carefully peel off parchment paper. Put on rack to dry until thoroughly cool. Once cooled, meringues may be wrapped in saran and frozen or store in an airtight container if using withing the next 24 hours. 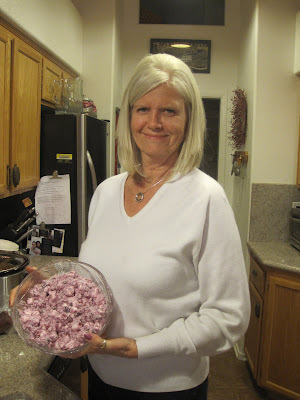 You can wrap each meringue in several saran layers, then stack gently in a large plastic container for freezing. Remove from freezer at least an hour before assembling. Slowly melt chocolate, when smooth remove from heat and let cool but not harden. In a large bowl, whip cream until stiff; gradually add powdered sugar and then vanilla. To assemble, place meringue layer on a serving plate, rounded side down. Spread a very thin layer of chocolate over it - can use a pastry brush. Top chocolate with a layer (about 3/4 inch thick ) of whipped cream. Top cream with a layer of berries. Repeat with second meringue, chocolate, cream and berries. Top with final meringue, rounded side up, and repeat layers. Refrigerate at least 4 hours or overnight. Garnish with several whole strawberries and chocolate curls. Use a serrated bread knife to cut in sawing motion. 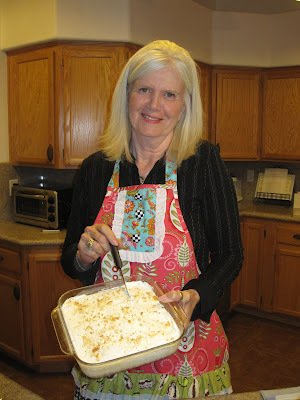 Mix half and half, whipping cream, sugar, eggs and vanilla. Arrange bread in 9 x 13 pan. Cover pan with foil . Set 9 x 13 pan in a larger jelly roll pan with water in it and keep water in it all the time it bakes so it steams. The "Chicks" have had a few months off and were ready to get back together and eat and socialize. That is what we do, ya know! The girls did not disappoint. Misty brought salad greens and a variety of fresh toppings. 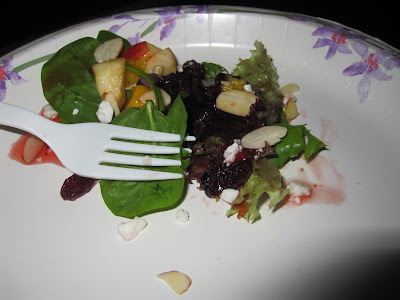 They included: feta cheese, chopped apples, mango, craisins, sliced almonds and raspberry vinaigrette. Wonderful and refreshing! 2 (14 oz.) cans of sweetened condensed milk. 1 (9 inch) prepared graham cracker crust. Combine egg yolks, sweetened condensed milk, and lime juice. Mix well. Pour into unbaked graham cracker shell. 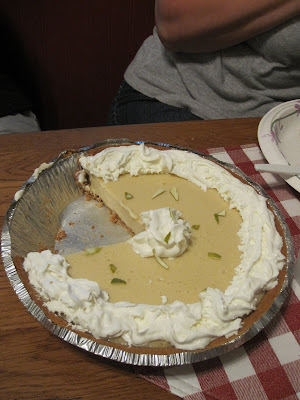 Top with whipping cream and garnish with lime wedges if desired. Connie and her ice cream dessert. Doesn't she look cute in her fun apron? Crush crackers and mix in margarine. Pat in 9 X 13 pan. Mix ½ gallon mushy ice cream with 2 pkgs instant coconut cream pudding mix. Pour over crushed crackers. Put in freezer for a while and then put 1 8oz cool whip on top of ice cream and sprinkle either some coconut or a few crushed Ritz Crackers on the cool whip and refreeze. Set out for a few minutes before serving. Mix the above items together. Refrigerate. *** This salad is MUCH better the next day! 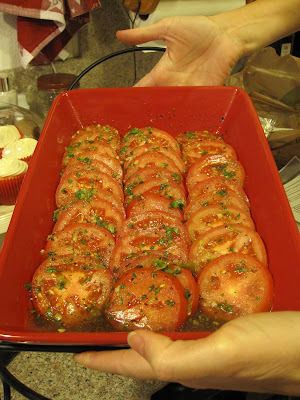 Michelle shared Marinated Tomatoes. I can't wait to try these with some fresh garden tomatoes. 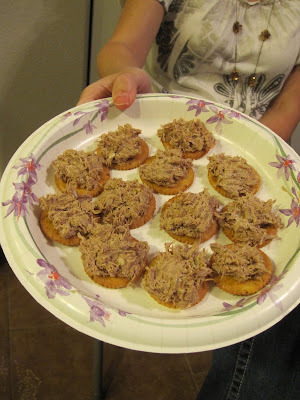 Bev brought a Beef spread for crackers....it was a new take on an appetizer. Delicious! Left over shredded beef from a roast beef dinner. Season with mayonnaise, chopped onion and horseradish to your liking. Serve on a variety of crackers. Prepare cake according to package directions for cupcakes. Cool completely. Using a fork or wooden skewer, poke six or so holes in each cake. Prepare jello using ingredients above. 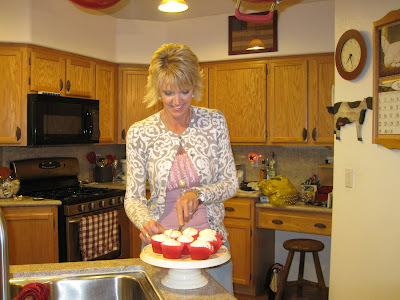 Place the cupcakes in a pan, because come of the jell-O might overflow. Put the jello into a squeeze bottle and squeeze in to each hole. Place in fridge for a few hours. 1 small pkg vanilla instant pudding. Wisk pudding, milk and vanilla until smooth. Fold in coolwhip. Place in fridge for about 30 min to thicken. Place in piping bag to frost. Mix altogether until well mixed. Divide between two pans and top with reserved crumb mixture. Freeze at least 6 hours before serving. Best if frozen overnight. Will keep for up to two months in freezer. Becky, the newest "Chick", brought tortilla chips and 3 different dips: salsa, hummus and cilantro dip. Pretty sure these little gems could have been the icing on the chocolate cake last month when we had "chocolate coma". Even if you don't like chocolate, you will like them. I had two different people tell me that when I offered them one. Those people ate two! Let cool 5 min, remove and drizzle with melted white chocolate or runny vanilla frosting. Top with sprinkles. Makes one entire package of oreos. I know it's hard to believe but there really is such a thing as too much chocolate. 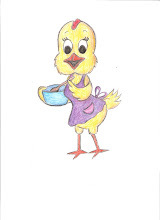 By the end of the night, most of the chicks could hardly take one more bite of something chocolate....MOST but not all. There were some really amazing recipes shared. Some very rich, dark, chocolate recipes. The night was half over when I realized I had not been snapping pictures. Of course all the chicks LOVE having their picture taken (NOT)! Here are the few I snapped. Beat together on high for several minutes until frosting changes color and is light and glossy. Spread over cooled mint layer. Sprinkle lightly with crushed candy cane if desired. Let set for about an hour before serving. Ice brownies while warm with the mint and then the frosting, the two layers will run together somewhat, but this is delicious served with ice cream. 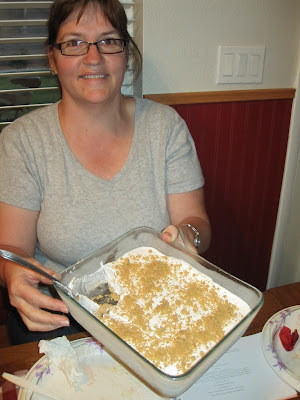 Suzi - Q made "Robert Redford"
In a saucepan, combine graham cracker crumbs, sugars, butter and milk. Bring to a boil, stirring constantly. Cook and stir for about 5 min. Grease a 9X13 pan and place a single layer of ritz cracker along the bottom. Top with half of the graham cracker mixture. Repeat layers and then top with remaining ritz. In a microwave safe bowl, combing chocolate chips and peanut butter. Microwave on low, stopping to stir occasionally. Do not overcook. Pour over the crackers and refrigerate until firm. When ready to serve, cut and let stand at room temp for a bit, just to soften slightly. 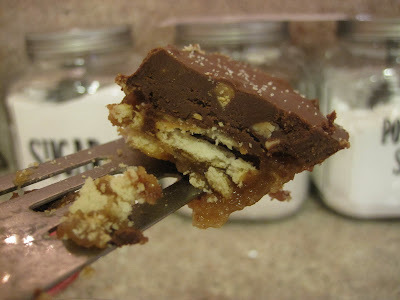 Sprinkle each bar with sea salt. In medium saucepan melt chocolate and butter over low heat, stirring constantly. Add sugar and half and half, and continue stirring until thick. (This takes along time for me.) Gradually add condensed milk. Cook 20 minutes, stirring occasionally. (Optional: stir in liquor.) Serve warm. Keeps indefinitely in the refrigerator; reheat before serving. Freezes well too. 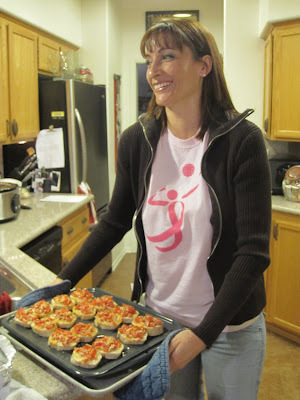 We're just some Las Vegas chicks, getting together to share good recipies, great food, and even better friendships.